Roebling Road Raceway is available to rent by organized club groups with event history, race teams. photo shoots, or manufacturers. We offer a friendly atmosphere and a great facility for your test day, track day and racing events. In order to rent the track you must have a competition license, or come in with a group that is hosting an HPDE (High Performance Driver Education). For motorcycles, you would need to contact Ed Bargey, Podium Motorsports, WERA, or CCS. Please find a full list of groups here. If you have no prior experience renting a track please contact one of the groups listed here. Pick your type of event. Check our event calendar to see if a date is available or call the track at 912-748-4205 to pick your options and reserve your date. Enjoy the experience of Roebling Road Raceway. Below are some of our popular packages. Often on race weekends there is not enough time to test the settings you want or to allow a driver to get up to speed in a relaxed atmosphere. For that, Roebling offers up the use of the track for test days where you and your team can have the track to yourself or share it with a small number of cars. Sometimes it’s easier for people to get a day off of work than from the weekend family time, and often groups like to run week day events. Call us for pricing on a Monday-Thursday event including ambulance and fire truck with safety crew; a pit out/control worker, corner workers, a gate attendant and insurance. Many drivers want to experience the track without the crowds of a big event. For that, Roebling is available for Monday-Friday track day/high performance driving experience for you and a few of your friends including a professional driving coach to help make your day a success. If you already have a racing license or have been to a driving school/drivers education there will not be a requirement for a driving coach. Roebling Road Raceway has been hosting large lapping day, drivers education, racing school and club racing events for more than 50 years and has the facility and experience to make your event a success. Prices will depend on the time of year, size of your event, number of workers, gate hours and everything else you need to make your event as smooth and successful as possible. Contact us to reserve the track for your event. Roebling Road is not limited to only the types of events listed above – we are available for hospitality days, ride-and-drive events, TV/Movie Filming and photo shoots. In the past Roebling has been used for Dealer Customer Appreciation Days, Filming for the TV Show Motorweek and was used for a popular music video. 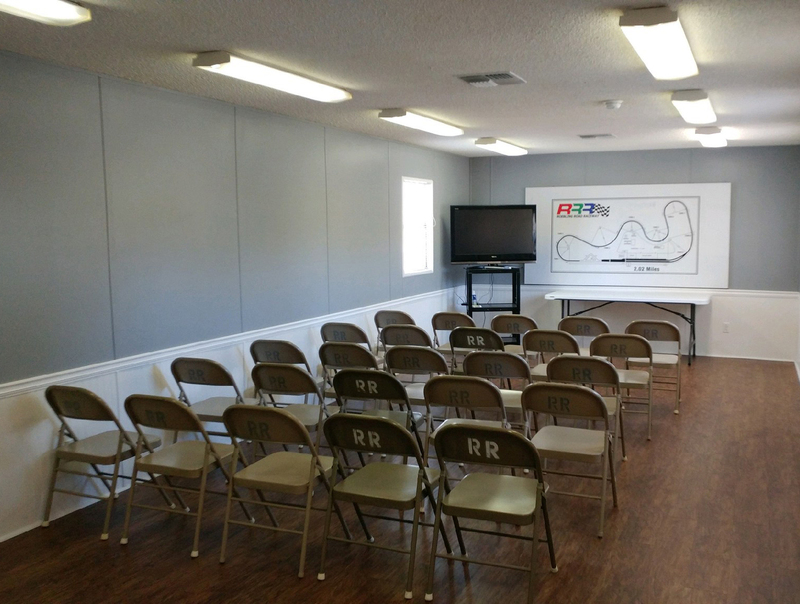 We offer classroom space for driver education and training.